We know you'll love this	20cm copper casserole	as much as we do. A great all round casserole pan The casserole pan is a wonderful marriage of form and function. First of all it's simply a great pan. It heats evenly with none of the hot spots you can get with steel pans, and yet responds brilliantly to changes in heating temperature. It is incredibly efficient whether you're softening onions, maintaining a slow simmer or sizzling and browning meat. Secondly, it's a fine looking pan. The shape and cast iron handle give it a classic feel while the brushed copper adds something contemporary. It will look great in pretty much any kitchen. 1041 customers found this review helpful. Did you? Yes, I did! I love my copper casserole! I bought the 20cm copper casserole to make up a set of copper pans for my kitchen & it is such a great purchase. I use it all the time - practically every day. It is a real work horse! If you have never used heavy copper pans before, they do take a bit of getting used to: the weight & the use of heat is so different, but once you get the hang of it they are an absolute joy to use! Plus, I have to say as well as being incredible to use, they are simply beautiful to look at - my Falk copper pans are my pride & joy! Great quality piece I really like this pan as it’s such a nice size for medium-sized casseroles. It cooks everything evenly with no hot spots and when it’s done washes-up easily too. The finish is beautiful and, because it’s got the brushed exterior, is easy to keep looking beautiful. Very sturdy construction and all round a great performing pan. 1011 customers found this review helpful. Did you? Yes, I did! Best customer service ever FALK copper pans are absolutely classy and practical. And you will surprise for FALK customer service! It has been most helpful and wonderful. Most Versatile Pot What's great about this piece is you can use it for a variety of purposes. You can make soup, stew, porridge, deep frying, noodles and I'm sure there are a few others I haven't thought of. This is probably the most used piece in my collection. 999 customers found this review helpful. Did you? Yes, I did! Superb Quality I'm replacing French cast iron cookware which had aged badly. My new Falk pans are everything I hoped for: they are lighter than my old ones but have superb stability and conductivity. Their performance is matched by their good looks. 936 customers found this review helpful. Did you? Yes, I did! Fab Casserole What can I say? Just a great pan. Boils water in a jiffy, keeps the heat fabulously, makes my chillis so darned good I want to cry. I think it's probably indestructible and (apart from the patina coming on) looks like it did out of the box. 922 customers found this review helpful. Did you? Yes, I did! Perfect Pan The pan is very well-made with a refined finish. The copper polish is perfect on all sides. The cast iron handles do get hot on the stove but provide a nice visual contrast to the copper. The pan is heavy on its own, even more so with water inside, but heats up very quickly, which is especially important for slow-heating electric stove-tops. My overall impression is that this pan will last forever! 883 customers found this review helpful. Did you? Yes, I did! Superior Quality Products & Excellent Customer Service! 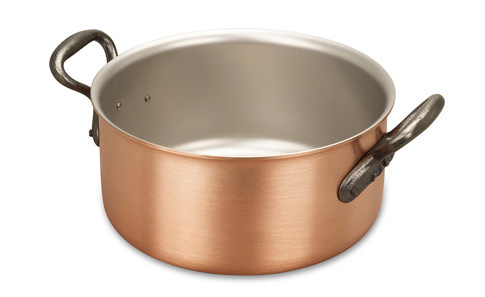 I didn't have to research copper cookwear online for very long before I saw the common theme of people raving about Falk Culinair. I bought this item as part of the Starter Set, a great combination of products that helped us to start our collection! The quality is perfect, which can be felt by the weight and sturdiness of the item alone. The perfect finish of each product, superior cooking (due to even heat transfer) combined with excellent customer service and super fast delivery made for a very pleasant purchase overall. I'm looking forward to using these pans for many years to come and would 100% recommend Falk Culinair's product to anyone in the market for top notch copper cookware. 882 customers found this review helpful. Did you? Yes, I did! 20cm Casserole Thank you so much for your excellent service. I don’t usually feel moved to comment but I have been impressed! My daughter received her delivery yesterday and is delighted with her gift. The delivery was quick and efficient, given it was to an international address (4 days from my internet order on a bank holiday!) and I was well informed throughout the process. 861 customers found this review helpful. Did you? Yes, I did! 859 customers found this review helpful. Did you? Yes, I did! Great size for rice or sides This pot is great for cooking enough rice to serve with a meal for the family. I love the size and shape of it. I have used it for Quinoa, rice, and millet, and it works well every time. Excellent - very happy! This was the first time that we have purchased copper pans and are very impressed by the quality and finish. Website was easy to navigate and delivery was fast and efficient. 797 customers found this review helpful. Did you? Yes, I did! Workhorse This is such a veratile pan given its size. Lovely to cook with - never any hotspots even on my AGA hotplates. Great service and advice from Faulk UK as usual. 779 customers found this review helpful. Did you? Yes, I did!